All of our connecting rod cores start out by getting degreased and cleaned. Then we closely inspect them for flaws and check them for twist and straightness. If any imperfection is found then the core will not be used. We then magnaflux the rods to check them for cracks and then they get shot peened and stress relieved. We then measure the pin bore diameters and check them for size, taper, and out of round. Then we measure all of the connecting rod lengths. 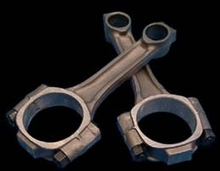 All new connecting rods get thoroughly checked as well. Then all of the rod bolts are removed and the connecting rod mating surfaces are machined and corrected getting ready for the reconditioning procedure. The rods are cleaned and then we install new ARP connecting rod bolts. The rod caps are installed, the rod bolt threads are lubed, and the new ARP fasteners are then torqued correctly in the appropriate sequence and to the correct torque specification. 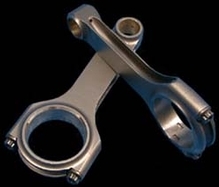 The connecting rods are then accurately and precisely reconditioned to the correct specification with exacting tolerances. The bearing housing is fine finished for maximum bearing heat distribution. 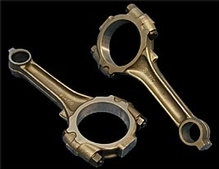 After the cool down time all of the connecting rod bores are final checked and confirmed for size, taper and roundness. The pin bores are fine honed to the correct size specification and to remove any and all imperfections, taper, or any out of round condition. We then side dress all of the connecting rods to insure the correct side clearance condition. The fasteners are un-torqued, all of the machining debris and oil are cleaned, and the connecting rods are prepped for assembly.